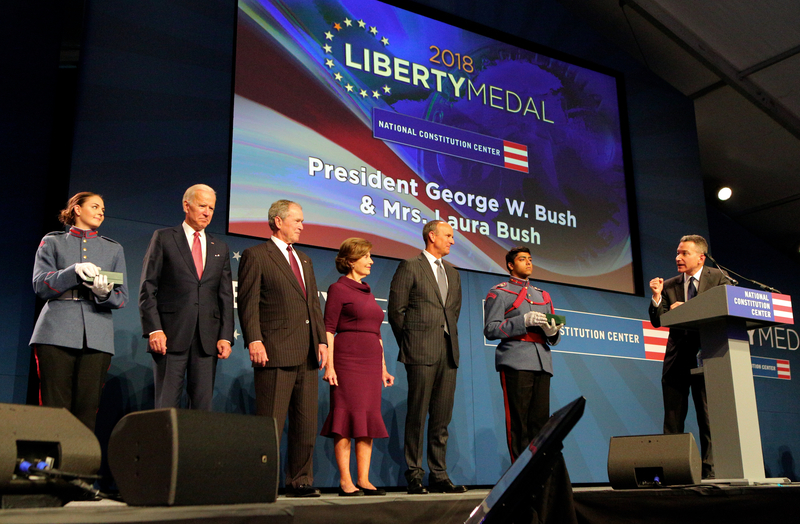 President and Mrs. Bush traveled to Philadelphia for Veterans Day last Sunday, where they were awarded the 2018 Liberty Medal by the National Constitution Center in recognition of their work with post-9/11 veterans through the Bush Institute’s Military Service Initiative. Earlier in the day, they dropped by a service project in the Point Breeze neighborhood of South Philadelphia with the Travis Manion Foundation and Warrior Wellness Alliance partners to clean up a local park. That evening they attended the Dallas Cowboys and Philadelphia Eagles football game, where they were joined on the field by Team 43 warriors as President Bush performed the ceremonial coin toss.